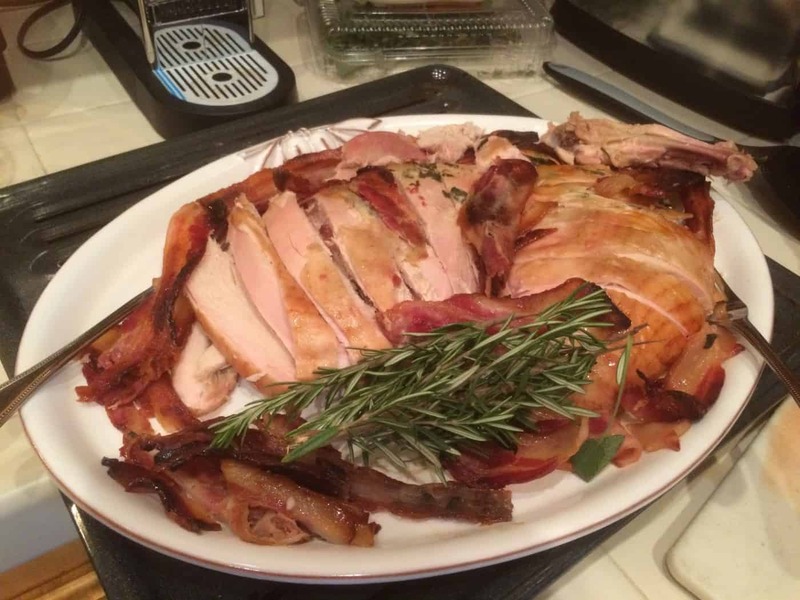 Guest: A Maple-Glazed, Bacon-Wrapped Turkey For Thanksgiving! What a delight to welcome John back for another of his awesome dishes. 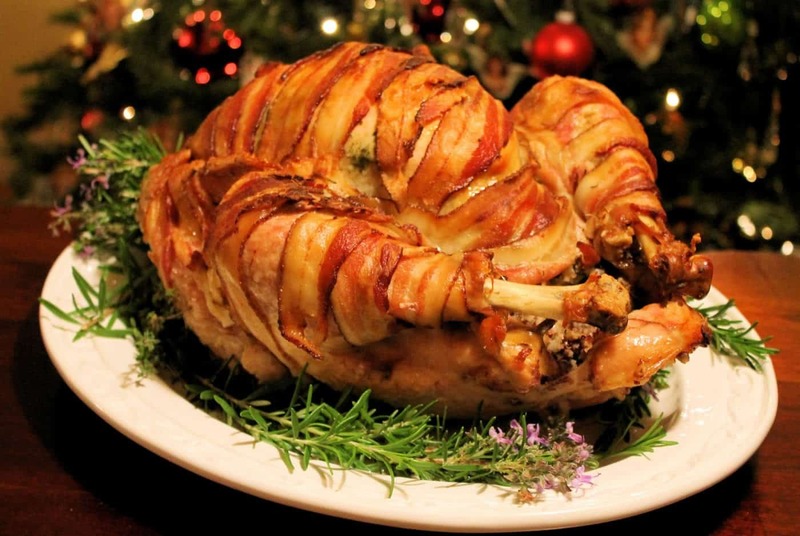 Enjoy his wonderful looking and #yummo Maple-Glazed, Bacon-Wrapped Turkey. Thank you, John, this does look moreish. I tried this for the first time last year, and I am doing it again – it’s just that good – and easy!My Recipe For A “Maple-Glazed, Bacon-Wrapped Turkey” For Thanksgiving! First, buy a Turkey a few days early and make sure it is thawed, we used a 14-pounder, which worked well, clean it out – setting aside the gizzard and neck for gravy stock of course! Pat your Turkey dry, salt and pepper the inside and then slather – and I mean SLATHER – the whole bird in butter. 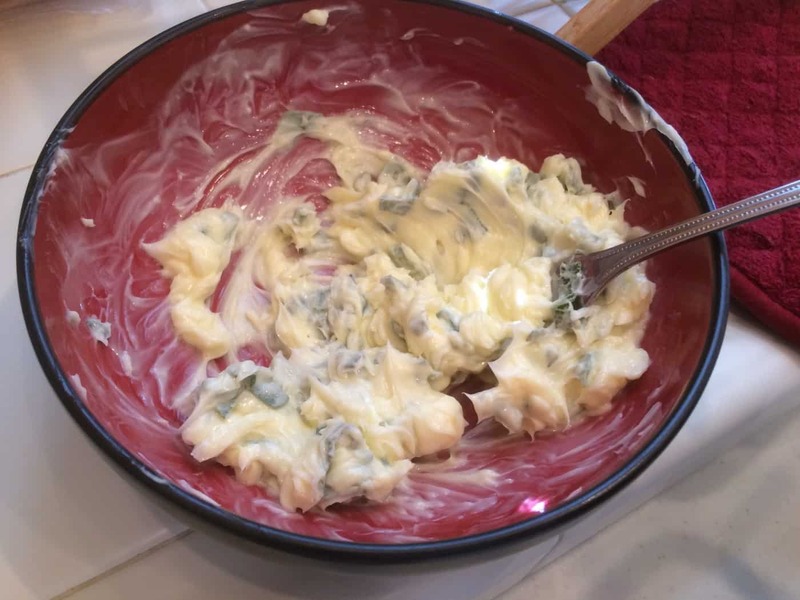 I use a variety of fresh herbs like Rosemary and Sage, chopped up and integrated into the butter as I rub it on, and then you want to grab your best friend in the world, BACON! How easy is this? 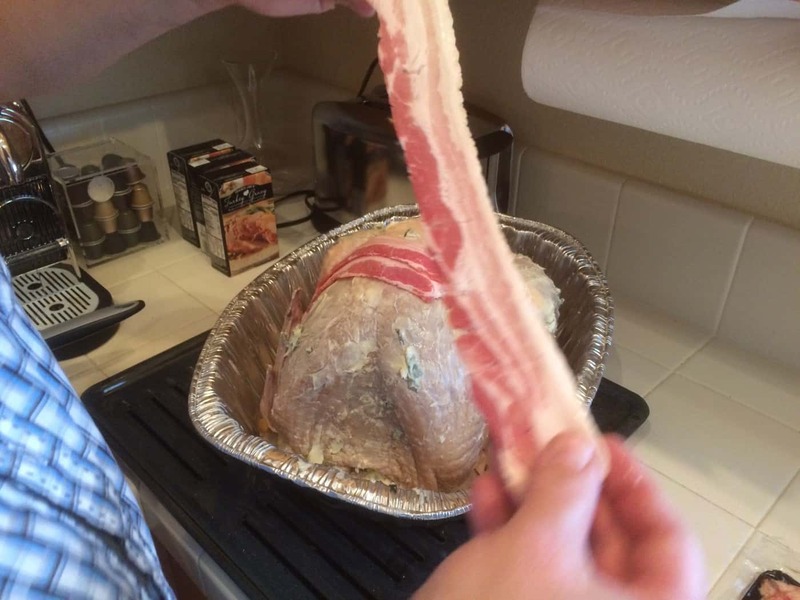 Decorate your Turkey with bacon! It will stick nicely to the butter, is easy to maneuver around the drumsticks and wings, and looks great when you are finished! Time To Stick This Bird In The Oven! For me, Turkeys are incredibly easy to make. 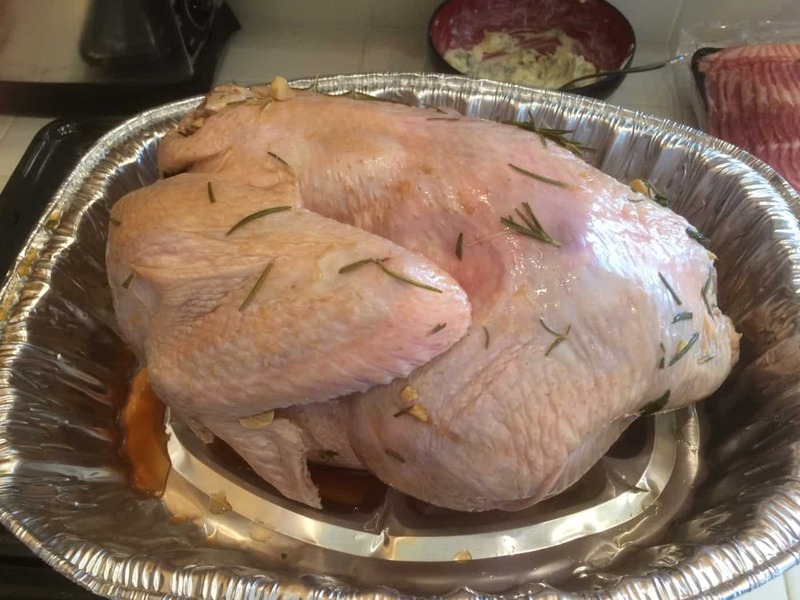 You can always find great recipes and cooking guidelines online and in a wide variety of cookbooks and magazines, but I cooked my 14-pounder for 3½ hours at 325 degrees. I tented it for the last 45 minutes with a brown paper bag, but you can also use aluminum foil – just to make sure it stayed golden brown. 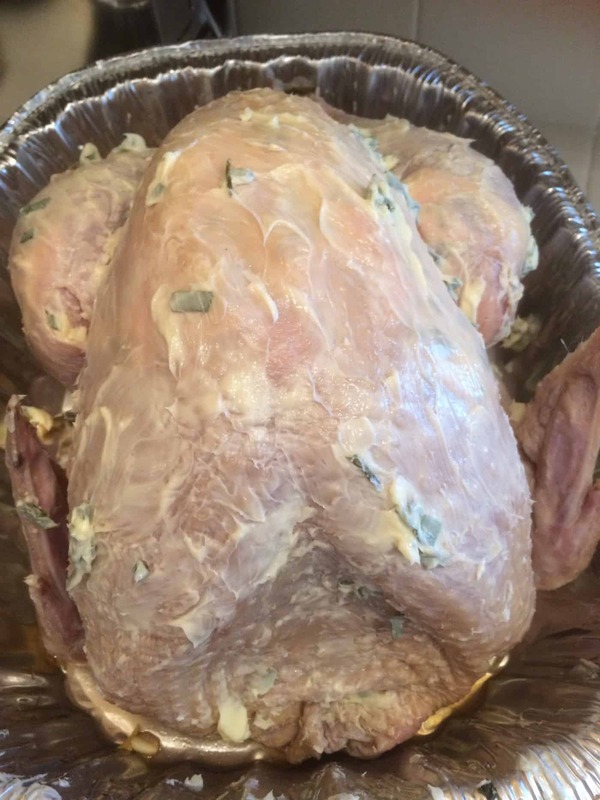 Of course, you will use a thermometer to check the internal temperature and always double-check for what the experts recommend for the right internal temperature when you are done, just let the bird rest for 20-30 minutes and it’s ready to carve. The bacon falls off easily, and you can add a bit to each plate since it is full of maple goodness. Potatoes Au Gratin, Provencal Carrots and dressing complete the plate, Enjoy! Thank you so much. Hubby also said that we will try this bacon on a chicken the very next time we do chicken, which will most probably be next week. I can about taste that combo. 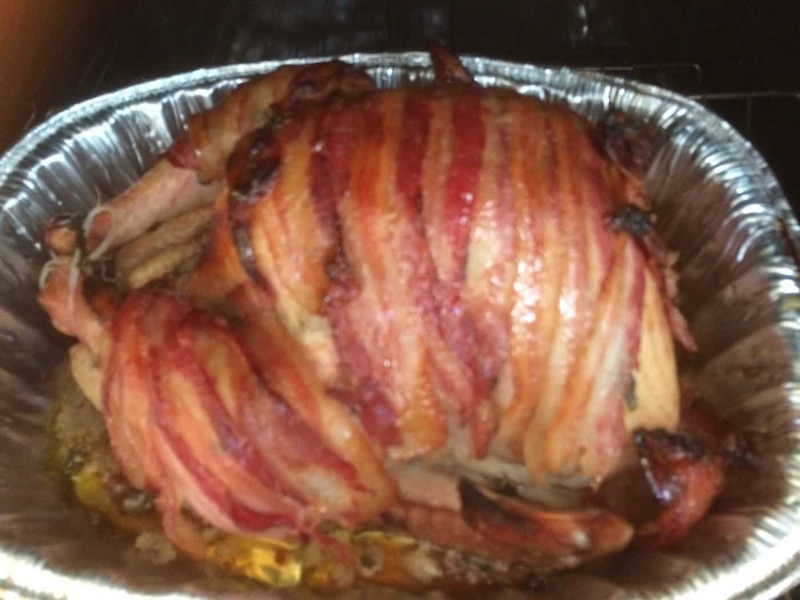 I have made this twice and will be making it again – you don’t even have to eat the bacon, it just keeps the Turkey juicy, and adds a smooth sweetness to it! Yummy. . . i am going to try this soon. Thanks so much – this is on my do make list as well. It’s terrific and so easy! 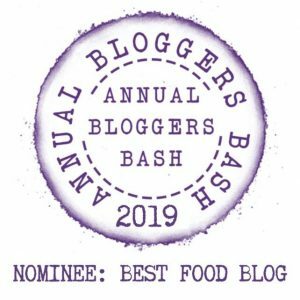 Well this looks and sounds divine Esme!! I bet your house was smelling absolutely amazing while this was cooking! I still have to cook this myself. John my Guest Blogger made this one. But yes, that is true, it really does fill the room with a delicious aroma while cooking!